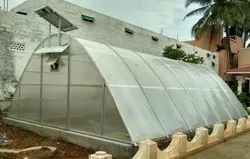 Leading Manufacturer of solar tunnel dryer from Coimbatore. Solar dryer is been used for drying coconut, chillies, fruits, nuts and vegetables. Hot air is been generated for drying the products. Capacity can be desided on customer requirement and customized dryers can be installed.